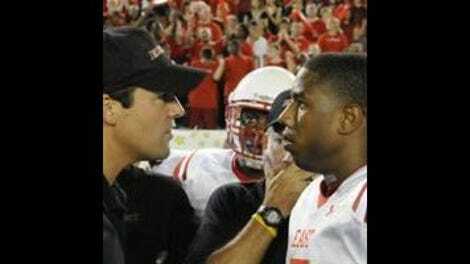 Friday Night Lights: "Perfect Record"
When Vince first met Coach back at the beginning of last season, he knew little about football and even less about life beyond the scrappy, criminal existence he’d been living on the streets. Everything good that’s happened to him since then—football stardom, Jess, self respect—has come because of Coach, and he knows it. Well, almost everything. It’s his father who kept him safe when one of his past gang associates surfaced. And it’s his father who's made his mother happy. 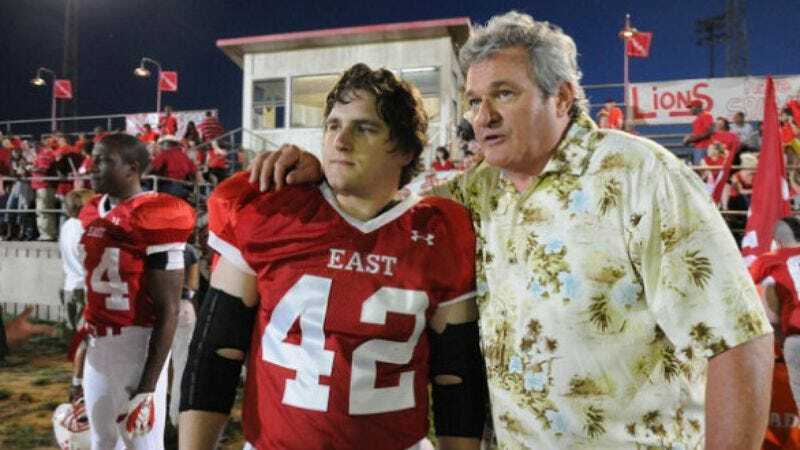 Where before he was wary about his dad’s motivations, he now has concrete evidence that his father has his best interests at heart and recent evidence too, evidence that may overwhelm what he knows about Coach. He’s in a tough situation, but only one of the two men looking after his future each in his own way regularly feeds his ego and only one has the pull of family on his side. That Vince could turn his back on Coach seemed impossible as recently as two or three episodes ago, but the show has made the turning away feel convincing. I regularly confess that my understanding of football is passing at best, so I can’t speak to the believability of Vince’s development as a player. But his development as a person has felt quite believable to me (thanks in no small part to Michael B. Jordan’s performance). Coach gave him the help he needed to be a better person and a better player (which the show sometimes regards as one as the same). Now he has different influences and self-confidence has given way to swagger and egotism. It’s a convincing portrayal of how the psyches of superstars get constructed as boosters and parasites—and Vince’s dad has yet to prove himself the latter, no matter how strongarm his tactics—build a wall around those who show potential to go far. As a viewer invested in Vince’s fate, I hope he learns to see over it, but that doesn’t seem too easy. Much of “Perfect Record” focused on Vince’s situation, in part because it played out too conspicuously for anyone to ignore, at practices, after the game, and even at the barbecue. It’s on the verge of becoming a public embarrassment for Coach—or worse, if he in any way became implicated in Vince’s dad’s backroom dealing—and a challenge to his authority played out in plain view. Even those unfamiliar with the situation see it, like a visiting Jason Street. And, clearly, I’ve buried the lead since, hey, Jason Street’s back. Nice to see Scott Porter and nice, too, that the show made his appearance fit into the season’s action, letting him comment on the Vince situation and try to lure Coach into the college world. I hope we haven’t seen the last of him this season, though that seems unlikely given that Coach’s potential recruitment remains an open question. Coach’s desirability on the job market makes sense. Not only does he have a perfect record and made something out of nothing, but he’s created a winning team by instilling discipline into kids who never knew it before. That’s why he’s confident that the release of their criminal records—however embarrassing to him and to them—ultimately won’t matter. They’ve won the right way. Until now. In addition to dealing with the relationships between children and parents, this season is turning into an exploration of whether how one wins matters. We saw it with “Kingdom,” and the issue’s even more at the fore here. The big game turns out to be a blow-out, but it’s an ugly one. Billy pushes their aggression, but Coach isn’t blameless in the matter. “Friday, what do you say we punish?” is a vague enough request to sound like plausible deniability should the game turn rough. And it does. The plays looks nasty. The insults sound nastier. And Vince showboats at the end, taking orders from his dad and running up the score in an unsportsmanlike manner. It’s enough to prompt the usually agreeable Coach Crowley to say, “That’s not who we are, Eric,” sounding like the conscience Coach has been ignoring. Not that he doesn’t have plenty on his mind already. Jess keeps bothering him for a letter of recommendation that he takes care of with a phone call—then goes back to ignoring her and her love of the game to focus on Vince. Julie remains at home and seemingly happy enough to stay planted. Tami can’t even make the game because she has to—or at least chooses to—drive up to the undisclosed location of Tami’s college to pick up her books. And what an interesting moment that is when Tami and the T.A. both recognize that each knows who the other is then fail to acknowledge it. It seems out of character for Tami—who surely has opinions about him and rarely keeps any opinions to herself—until you consider how much she wants Julie to be her own person. Stepping in would ruin that. Trouble is, Julie doesn’t seem really to want to be her own person. She’s regressing. Even if she’s not trying to crawl back into the womb, as Coach suggests, then she’s certainly not moving forward. And if something doesn’t quite ring true about this episode and this season, it’s that I’m not sure that’s consistent with the Julie we’ve come to know. Luke, on the other hand, finds it impossible to behave out of character. He gets rough coaching and bad romantic advice from Billy this week. Or does he? However transparent, and short-lived, his cold-shoulder act, it does do the trick with Becky, at least for now. Allegiances, whether romantic or athletic, have a way of shifting in Dillon, and taking skin with them as they do. So I guess the McCoys aren’t such a force in the Panther world anymore? Ending moments have mattered a lot this season. Sometimes they’ve been extremely subtle. That’s not necessarily true of this week, but TMU’s manipulative way of getting at Vince was a blink-and-you-missed it moment. So was the end of “Kingdom,” about which the gay pop culture site AfterElton has an intriguing theory.